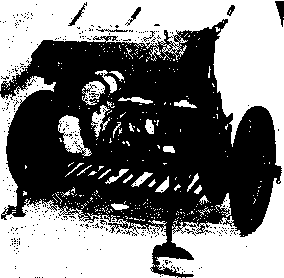 The pluggers were used by some growers with positive results, but high labor costs encouraged the development of an automatic planter. The tractor-mounted automatic planter meters up to i/2 cup of loose mix into revolving cups which deliver the mix to (he planter pocket». The pockets pierce the soil and deposit the mix at fixed intervals. Presswheels can be mounted behind planter pockets to firm the soil from each side on unmulched beds. The unit works well without presswheels on mulch-covered beds, the pockets punching holes through the mulch as they deposit the mix. The toolbar-mounted planter has operated efficiently at a forward speed of I mph and is designed to plant at down-row spacings of 10, 12, 20, 30, 51, or 60 inches.